The beautiful shores of the 200-mile-long Chesapeake Bay offer over 11,000 miles of shoreline, with many sites remaining undeveloped and serving as hidden gem getaways away from the crowds and tourists of other East Coast sites. These beaches and beachfront cities are conveniently located near the nation’s capital and offer family-friendly attractions, public special event programming, and plenty of opportunities for outdoor summer fun. 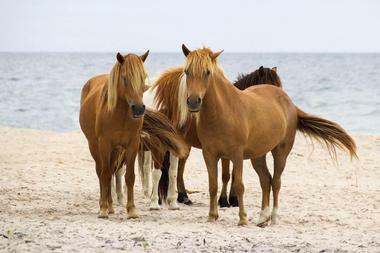 Assateague Island National Seashore preserves large sections of the 37-mile Maryland and Virginia barrier island of the same name, which is also home to Assateague State Park and Chincoteague National Wildlife Refuge. The park was developed in 1965 to protect the island forming significant hurricane damage throughout the mid-20th century, which thwarted the development of the Ocean Beach resort town. Today, 41,346 acres of shoreline and surrounding waters are protected as part of the seashore, which is open to the public year-round and attracts more than one million annual visitors. Two National Park Service visitor centers are offered on the island, along with ample opportunities for outdoor activities such as swimming, surfing, hiking, and kayaking. Breezy Point Beach and Campground has been managed by Calvert County Parks and Recreation since 1995 and is open seasonally between May and October, offering a variety of family-friendly summer shoreline activities. 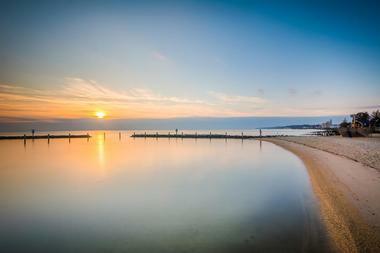 The beach is home to a half-mile of Chesapeake bay shorefront, which features a netted swimming area, 200-foot fishing pier, and ample area for sunbathing and relaxation. Picnicking and grilling is permitted throughout the beach, including rental use of two sheltered picnic sites accommodating up to 100 people apiece. Seasonal campsites accommodate RVs, trailers, pop-ups, and standard tents, offering water and sewer services and hosting up to six people per campsite. A children’s playground, bath houses, and a concession stand are also provided on site. Chesapeake Beach is a resort community that was established at the ending site of the Chesapeake Beach Railway at the beginning of the 20th century and was a popular weekend destination and gambling site until the Great Depression. Following its listing on the National Register of Historic Places in 1980, the town has experienced a revival as a resort area, offering attractions such as the Chesapeake Beach Water Park, which features eight water slides, a lagoon, and a children’s play area. Other major attractions include the Herrington Harbour marina resort, voted as the best marina in America by Marina Dock Age magazine, and the Railway Museum, which preserves the city’s railroad and social history through a variety of exhibits. Beachfront activities are permitted at Bay Front Park and Brownie’s Beach, which offers access to a beautiful stretch of Chesapeake Bay shoreline just south of town. Kiptopeke State Park’s lands were first recorded by Captain John Smith in 1608 and have become a major recreational site along the Chesapeake Bay, located on the eastern shore of Virginia. 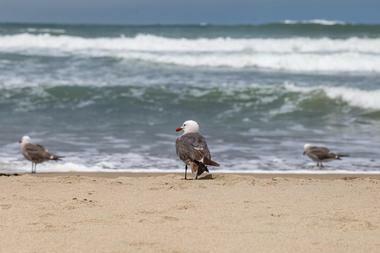 The 562-acre park serves as a migratory coastal bird habitat and showcases more than five miles of hiking and hiking trails, along with seasonal swimming at two unguarded beach areas between Memorial Day and Labor Day. In addition, the park’s south beach area offers opportunities for fishing, boating, and crabbing, with launch and parking spots available for up to 70 boat trailers. A lighted fishing pier is open between April and December, and overnight accommodations are provided at a number of cabins, lodges, yurts, bunkhouses, and conventional RV and tent hookup campsites. Other attractions include a children’s playground, a beach bathhouse, and day-use picnic areas. Leesylvania State Park is located along the shores of the Potomac River in Prince William County and is listed on the National Register of Historic Places for its connection to a number of Virginia’s most famous historic families. The park has been open to the public since 1992 and offers a myriad of seasonal land and water activities, including a universally-accessible 300-foot fishing pier for largemouth and striped bass, catfish, and perch fishing. 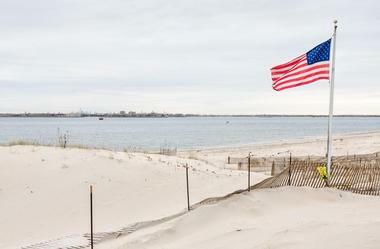 Though swimming is not permitted due to hazardous water conditions, a natural sand beach provides access for other shorefront recreational activities. Canoes, kayaks, paddleboards, and sailboats may be rented from the park’s Breakwater Marina in season, and a primitive campground site is available for group overnight camping. Matapeake Park and Beach is located on Kent Island across the Chesapeake Bay Bridge from Annapolis, occupying grounds formerly used as the landing for the Chesapeake Bay Ferry System. The county-owned park and beach are open to the public daily between dawn and dusk and serves as the northern terminus of the six-mile Kent Island South Trail, which provides walking and biking access throughout the island. The former ferry house and landing have been restored into a clubhouse and fishing pier, which offer spectacular views of the nearby bridge and waters. A public swimming beach allows dogs on leashes, and several trails provide access to nearby natural sites. Other amenities include a family picnic area and an outdoor amphitheater that hosts periodic concerts and public special events. North Beach is a town and public beach that is known as the “Jewel of the Chesapeake Bay,” located approximately one hour from Washington, D.C. The city is a more low-key day-trip alternative to neighboring Chesapeake Beach, featuring a quaint flower-lined boardwalk and attractions such as the Bayside History Museum, which showcases exhibits on the region’s social and cultural history. The city’s family-friendly beachfront is open to the public year-round from dawn to dusk for swimming and sunbathing, though visitors should note that no lifeguard is present on duty. 19 boat slips are available for free use, and fishing is allowed with a permit on the beach’s lower level fishing deck. Special events are held at the beach throughout the year, including Movies on the Beach events, a Halloween BooBash, and an annual New Year’s Day Polar Plunge. Sandy Point State Park is located on Sandy Point on the western side of the Chesapeake Bay Bridge, near Annapolis and Kent Island. Like its neighbor Matapeake Park and Beach, the park is the former site of a Chesapeake Bay Ferry System ferry landing that was purchased by the state of Maryland following the bridge’s construction. Today, the 786-acre park attracts more than one million annual visitors and is known for its spacious bayfront beaches, which are staffed with lifeguards between Memorial Day and Labor Day. Other popular activities at the park include picnicking, fishing, crabbing, hiking, and boating. Several historic sites are located within the park, including the Sandy Point Mansion, listed on the National Register of Historic Places, and the 1883 Sandy Point Shoal Lighthouse. 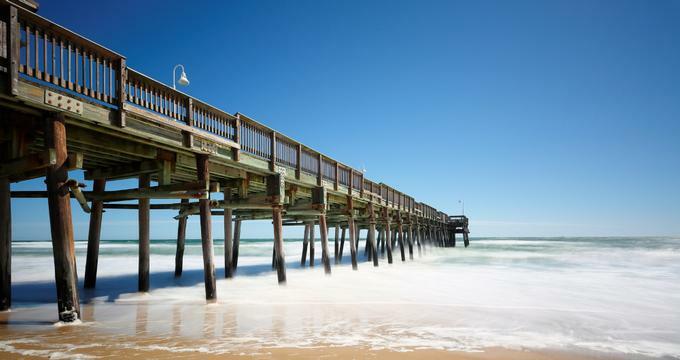 Virginia Beach is one of the most popular resort cities along the Atlantic coast, offering three miles of famous boardwalk and the Guinness Book of Records-listed longest pleasure beach in the world. 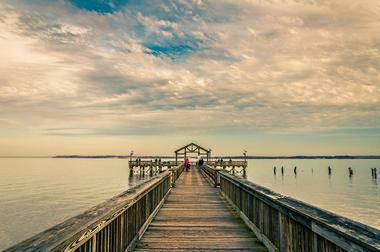 The city is home to major attractions such as the Virginia Aquarium and Marine Science Center, the Military Aviation Museum, and First Landing State Park, the site of the 1607 Jamestown colonists landing. In addition to the main boardwalk area, beachfront access is provided at a number of sites throughout the city, including the secluded Sandbridge Beach, the off-the-beaten-path Chicks Beach, and the wildlife-heavy False Cape State Park.